Double clawshots in action. Wheeeeeee! 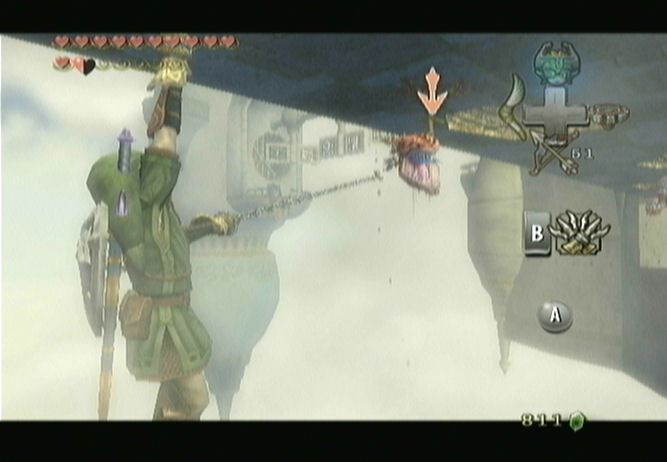 I'm replaying Twilight Princess (no surprise to those of you who know I'm a Zelda series fan), and got the double clawshot after finishing the City in the Sky dungeon this weekend (after a nice long day of unpacking, cleaning, and hauling stuff around). Thus began a night of running around completing sidequests and finding double-clawshot hideaways and pieces of heart. You know, as one does when presented with a new toy in a video game. It's been nearly a month since I'd last played, so of course I had to put some extra effort into side-questing. Of course, being a month since I'd had the chance to play, it wasn't until the very end of the night, staring down the throat of the portal to the Twilight world, that I remembered my Dominion Rod had been fully charged. And I hadn't found and ordered around all the statues in the world yet. No, Midna, I'm not going to go defeat that enemy for you. I've got more sidequests to do. What, we probably shouldn't leave the portal open and unguarded? Pssssh, it'll be fine. If there's one thing my adventures in my many lives in time have taught me, it's that enemies always wait until you're done sidequesting to make any major moves. But that reminded me, as I headed off to sleep, that I still don't have the mirror shield yet. I mean, really. It's an awesome item. Why doesn't it come until the end of the game? The problem with really cool items is that they usually come far too late in the game. You want to spend hours playing with them, and keep imagining how they could have been used in earlier dungeons. Yeah, sure, you can go back and use them, but... not the same. The double clawshot, for example--SPIDERMAN ITEM. Why couldn't you give them to me at the beginning and let me spiderman around Kakariko Gorge or Death Mountain from the very start? Link's feet would never have touched the ground! It would have been so much fun! What games have fun items that you don't get until much too close to the end, that you would have preferred to have the chance to use earlier? What are the items you wished you could have had the entire game, that really deserved more uses than the game incorporated? I remember playing Pokemon Silver and having to walk by so many areas that I couldn't enter because I didn't have the proper HPs. Then I finally get them and have to go aaaaaall the way back through the entire map re-locating those places so I can do all the things. It was a pain.